Former Black Satellites gaffer, Sellas Tetteh has been linked to replace busy Ibrahim Tanko at the helm of affairs for the Black Meteors. 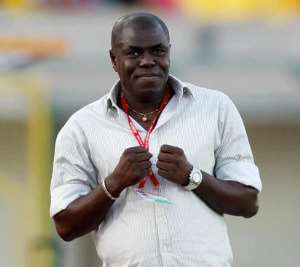 Sellas Tetteh led the Black Satellites to an historic U-20 World Cup triumph in 2009 at Egypt. Ibrahim Tanko who heads the Black Meteors also doubles as an assistant coach of the Black Stars. Tanko’s absence on the bench for the Black Stars against Mauritania has fuelled Sellas Tetteh link coach the Black Meteors. With the Black Stars Cup of Nations campaign approaching, it is understood the FIFA appointed Normalization Committee will relieve Tanko of his Black Meteors job for him to concentrate on the Black Stars. Sellas Tetteh who heads Tamale FC have also been linked with a move to Bechem United. The Black Meteors are currently at the final of the U-23 Cup of Nations and will play against Algeria in June, same time the Black Stars AFCON campaign will be kicking off.